Thanks for visiting my site and for your interest in my work. I am a freelance children’s book illustrator living near beautiful green Seattle. My early years were spent on the Central Coast of California in a little town called Los Osos. I did art for fun and enjoyed life in a coastal California paradise. 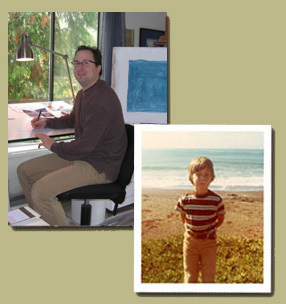 My college career began at Cuesta Community College in San Luis Obispo, CA where I received an A.A. degree in 2D Design; then I made the big move in 1994 to Seattle to attend Cornish College of the Arts. I graduated with a B.F.A. degree in illustration in 1998 and promptly began my carrer as an illustrator. I followed my childhood love of illustrated stories and history and in 2001 received my first children’s book job “Nathan Hale: Patriot Spy”. Since then I have illustrated 22 children’s books while also working on projects for children’s magazines, school text books, readers, a graphic novel and other avenues. For my books I often work in oil on illustration board, but I also use acrylic, watercolor, gouache, pastel, pen and ink, and the computer, sometimes all for one book as I did for the picture book “Natures Paintbox: A Seasonal Gallery of Art and Verse”. I enjoy sharing my knowledge of illustrated books and painting with students at various local colleges. In my freetime, I create art for myself and enjoy travel, hiking, movies, and sharing my books with children. I hope you enjoy my work and I look forward to hearing from you soon.